Networking | Masters of What? Each month PRSA San Diego interviews one of its members to be featured on its website and share about their professional experience. This month, I was lucky enough to be asked to participate and had the opportunity to share more about my experience with the research side of public relations. We’re poor. Like the “just starting out, eating Ramen noodles” kind of poor. We really wanted to get in the Christmas spirit this holiday season without spending too much money. In our ideal world we would’ve hit up the Apple store and bought 50 iPad Minis for all our besties, or possibly even some Swarovski-bling. However, that is most definitely not the situation we are in. So, in order to cover all the holiday giving for our super awesome group of gals, Nicole and I decided to throw a holiday party – DIY gifts included. We had fist practiced our DIY holiday gift with painted mugs†. Each of us had 6 mugs we dotted, and swooshed, and painted in all kinds of fun ways. Then the question of WHAT TO FILL THE MUGS WITH arose. After perusing Pinterest for a bit we landed on the idea of Salted Caramel Hot Chocolate Mix†. Coupled with a shot of Kahlua from BevMo and a cute ribbon these gifts were done! Now back to the party planning details! We wanted to have everyone leave our party with a favor and we decided that painting 2o Dollar Tree wine glasses was the PERFECT idea! 5.5 hours later*, we decided we may have taken on more than we could handle. However, the glasses came out adorable and once we came to the conclusion that the beauty of hand painted glasses are the small imperfections on each one, we loved them. When party night rolled around, I wanted to make sure we were really in the Christmas spirit (and we had something for our guests to drink out of their new glasses), so I decided to make mulled wine! I found Ina Garten’s recipe (pinned below) but we modified it a bit†. All-in-all our DIY Xmas turned out fantastic. 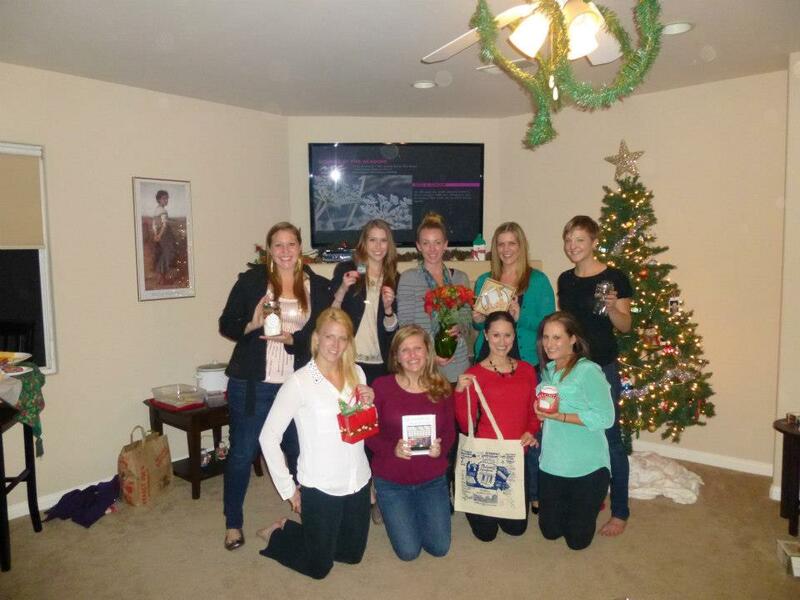 We had cute gifts to give everyone and even received a few during the white elephant exchange! A big thanks to Little Miss MBA for the inspiration on this one. Our 20 hand painted beauties. Take the mugs/glasses and clean them with the rubbing alcohol (this gets stinky!). Now set all your inhibitions aside and paint those suckers. We decided our fav pattern for the season was red, green, and white dots made with the Q-Tips. Drink wine as needed to get you through this process. Remember, they’re not all going to come out perfectly, that’s the beauty of DIY Christmas! 3 tablespoons pure vanilla extract – No modification here but this is still the most vanilla extract I’ve used in one recipe. 1 1/2 cups good quality Dutch cocoa powder – We ended up using an entire Hershey Cocoa box plus a little extra. Yea, yea, it’s not “Dutch” but we figure if you don’t like Hershey you’re not deserving of our delish mix. 1 to 3 tablespoons fleur de sel or good sea salt (My preference is 1-tbsp) We had no clue how to find this, so we used store-brand (plus, we’re on a budget here!). ONLY USE 1-TSP!!!! PLEASE! Don’t say we didn’t warn you! 10 ounces good quality bittersweet chocolate or chocolate chips – We splurged on the chips. Ghirardelli all the way. Line a rimmed baking sheet with parchment paper; set aside. Heat the 2 1/2 cups granulated sugar in a large heavy pan, over medium heat, without stirring. When the sugar begins to melt, take the handle of the pan and swirl it to melt without burning. The sugar might seem to crystallize, but it will eventually melt to a deep amber color. (Can take 10-15 minutes, so be patient.) This took WAY longer for us – be prepared. Remove the pan from the heat and carefully add the vanilla. Whisk the caramel until smooth again, then immediately pour it onto the lined baking sheet. Allow it to spread without touching it. Set aside and let the caramel harden, at least 1 hour. When ready to make the mix, use the back of a large spoon to tap the caramel several times into small broken pieces that can fit into the feeding tube of a large food processor. Turn the processor on, and while running, feed the caramel pieces into the tube so the processor pulverizes the caramel into a fine powder. Continue to add the pieces, a few at a time, until it is completely powder (a cloud of caramel dust will float out of the tube). Turn the processor off and follow the next steps to complete the mix. As usual I didn’t read the recipe fully when we started to make this…I don’t have a food processor. This was an excruciatingly long process with my immersion blender and various attachments. Store in an airtight container, in a cool, dry place for up to one month. To serve, stir 3 tablespoons mix into 1 cup hot milk. 4 cups apple cider – We used 6 cups instead of 8, anymore and we thought it tasted too apple-y. Go figure. 1 (750-ml) bottle red wine, such as Cabernet Sauvignon – We used 2 bottles of a Cab (more wine – happier party attendees!). 1/4 cup honey – We only used 1/4 cup for the doubled recipe, I don’t like things too sweet. 2 cinnamon sticks – I LOVE spices, I threw in 5. 1 orange, zested and juiced – We stayed in line and used 2 for the doubled recipe I now want a fancy zester to add garnishes. 4 whole cloves – Trader Joe’s did not have cloves so we didn’t use any out of pure laziness on my part of not wanting to hit-up another store. 3 star anise – EWWW I hate the licorice flavor, I left these out too. 4 oranges, peeled, for garnish – I just used the 2 oranges I had to squeeze – again, I need a fancy tool to make ganish. Combine the cider, wine, honey, cinnamon sticks, zest, juice, cloves and star anise in a large saucepan, bring to a boil and simmer over low heat for 10 minutes. Pour into mugs, add an orange peel to each and serve. <– Forget that. Throw it in a crock pot and forget about it! *I may have deluded you all a bit here in order to make the story better. The 5.5 hours included painting all of the 20 wine glasses, making the Salted Caramel Hot Chocolate Mix and packaging said mix. I’m a Blog Giveaway Winner! Whoooohoooooo! 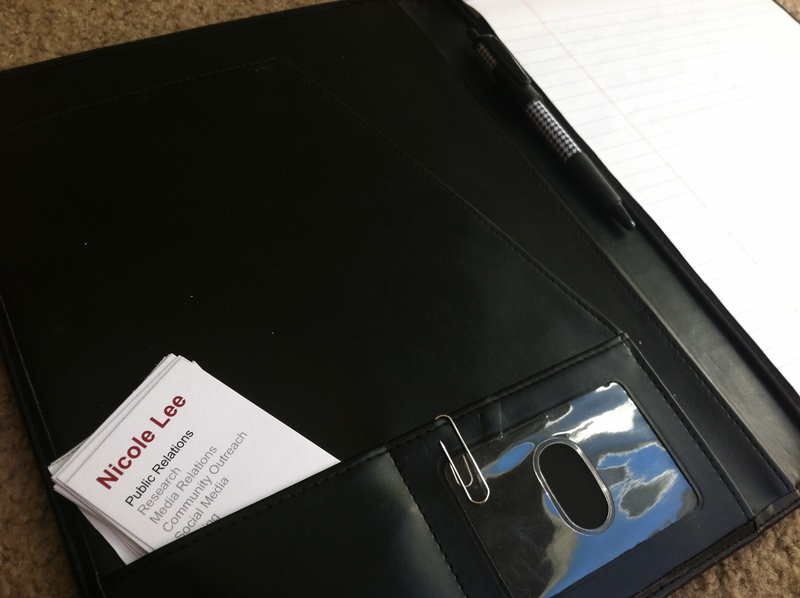 Nicole had posted about her wiley ways of winning swag online a few weeks back (refresh your memory and read her post). I read up on her tips and applied them AND WON!! Little Miss MBA (if you remember I told you all about her in a post about us getting our MBA’s) ran a contest where you commented on her blog and could receive extra chances to win by Tweeting or posting a link to her blog on Facebook. In the end, yours truly came out as the winner-winner-chicken-dinner! Just a few days ago I was able to collect my prize (you can’t image how busy 2 post-MBA, new-pro ladies living in SAN DIEGO are!) 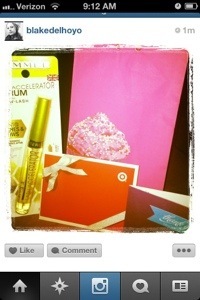 an eyelash volumizer, a gift card to target, and the sweetest note – all wrapped up in a cupcake gift bag! Nicole also added a couple prizes to her growing list of giveaway wins in the last couple weeks. On Facebook she won a golf shirt for her boyfriend from Ashworth Golf and on Twitter she won the new Airborne Plus Energy from @theairborneguy. So. All this contest entering and winning has given Nicole and I an idea, “Why the heck don’t we hold a blog contest!” But, we’re a little stuck. What do people out there want to win? Comment and let us know and we’ll do our best to accommodate (remember peeps, we’re newly out in the workforce so they’ll be no BMWs or weekend get-aways). Peers. People you go to school with or that start their careers at the same time as you are probably the easiest group of people to get to know and stay in touch with. While they might not be the ones hiring you right away, you never know if someone’s career will take off or if they will start their own agency down the line. Plus, you and your peers can share experiences and learn about opportunities to pursue, or avoid. Those with more experience than yourself. This is probably the most obvious. You want to get to know those senior communication professionals because they offer great advice, make great references, and of course, they are more likely to be hiring. Non-Communicators. 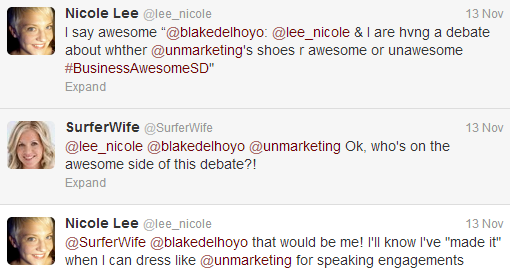 It’s not always PR and marketing people that hire PR and marketing people. This point is really what inspired this post thanks to a conversation I had with social media pro, Sam Afetian, yesterday. 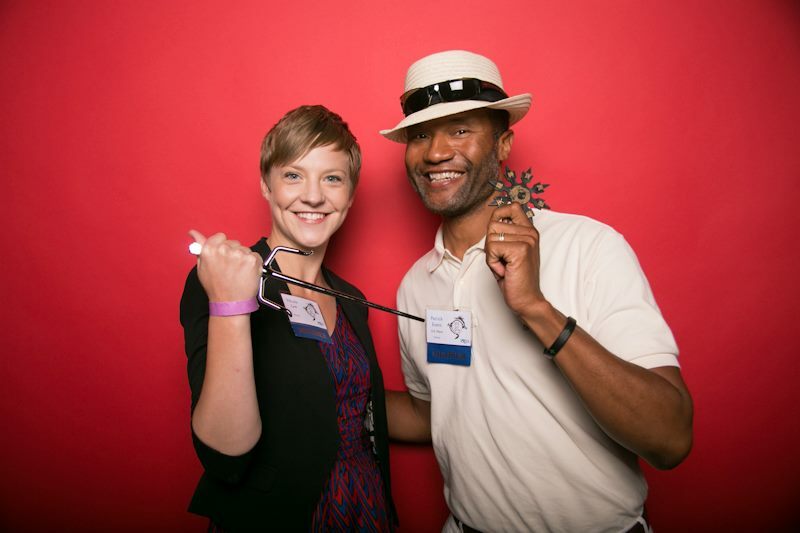 Business alumni and entrepreneurs are great connections because you never know when they may need some PR or marketing help, whether it is a full-time job or a side gig. Media. If you’re in PR in particular, you probably work with journalists. It will make both your job and theirs a lot easier if you know one another ahead of time. Get to know them and their interests and see what you can do to make their jobs easier. If they recognize your name and know you won’t send them irrelevant crap, they’ll be more likely to open your pitches. Get involved in professional organizations. 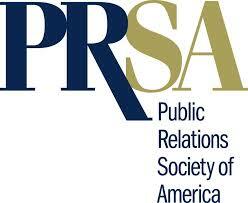 PRSA, IABC, AMA… these are just a few of the many organizations wherecommunication professionals congregate. Get involved in their events, and online communities. Go to events. Besides going to events held by professional organizations, look at alumni groups, general business networking events or even social events where you may have the opportunity to meet new people. Bring your business cards and don’t forget to follow-up later! If you’re meeting a lot of people, make notes on the cards you receive so you know where you met each person and what you talked about. Use social networking sites. This is likely the easiest and least intimidating way to meet or stay in touch with people. Twitter is always a great way to break the ice with particular people and hashtags provide a way to find those in your industry. LinkedIn is also a great place to chat and learn from others in your profession. Don’t just create an online resume and let it sit until you need a job, participate in groups, share information and engage with your connections! Meet in person and one-on-one. This is my favorite way to get to know people and although it takes time, the connections you make are a lot stronger. After meeting someone at an event, or even online, follow-up and simply say, “hey would you like to meet for coffee?” It really is that simple. I’ve had many coffee dates and they always turn a stranger into a solid acquaintance or an acquaintance into a friend. Be consistent/Stay in touch. Networking isn’t just about finding a job. Not only may you end up looking for a job in the future and need those contacts you’ve neglected, but professional networks serve other purposes. You can learn from them! Learn from the successes and failures of others, learn about opportunities for your clients or learn about industry events or awards. Keep your eyes open. You never know where or when you may meet someone so keep your eyes open and a business card in your wallet! Be giving. When meeting new people, don’t think about how they can help you now or later, think about how you can help them. If you have this attitude, it will reward you in the long run. Hope these help! And if anyone wants to get coffee, let Blake and I know! 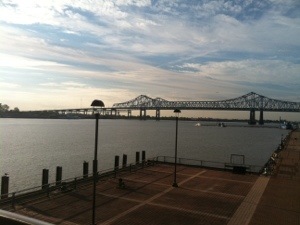 This post may be making it up a bit late today but I’m still in a New Orleans-work-conference-hangover-daze. Basically, this is the first week back from a week stay in NOLA, exciting right? The backdrop for our conference. 1). 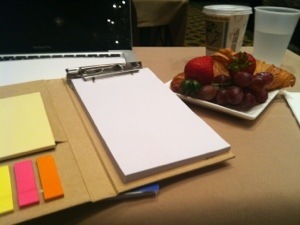 Make your presentation INTERESTING! Especially if your session is scheduled for 8 hours (*Ahem*, Google Training Day, *cough*) no matter how cool your swag is, I will fall asleep and resort to scanning my social media channels if your resonation is not interesting! If I can learn more about how to apply your product by Googling you, you’ve failed. Free food and swag can keep me interested for a while but not forever! However, I will give shout-outs to Eric Spellmann (@ericspellmann) for his fantastic presentation on the “12 Mistakes on Small Business Websites” and to Herb Lawrence (from @asbtdc_asu) who presented on how to utilize social media to engage both consumers and businesses. 2). Don’t bring up the main competitor. If you are presenting to a national organization don’t use their main compeitor as an example…I would’ve thought that was common sense. The entire time. I met a new co-worker that is stationed at one of my office’s satellite centers who I connected with and had so much fun with – I even gave her a mini Twitter schooling (follow @katienino and get her up to speed on all things Twitter!). I met incredibly helpful people that I will be in contact with regularly. Networking even allowed me to be mentioned on a different blog, check out my little mention here and as a plug for Jimdo and their SmallBizRocket initiative, if you need a website, these boys can help you out! Of course I had to hit Bourbon street and go on a few tours! This is the time where I really connected with coworkers and met a few nice people along the way (some of which even invited me back to visit their home in the future). 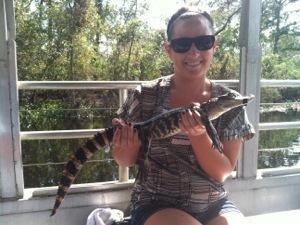 Baby alligators are somewhat squishy. Hold one if you have the chance! Yes, there was a baby goat on the street that I got to hold. This is the face you make when the baby goat you’re holding tries to jump from your hands. Cities around the world celebrated Social Media Day with meetups this past Saturday. Social Media Day aims to bring the online community together offline and celebrate, “the revolution of media becoming a social dialogue,” at least according the San Diego chapter website. The coolest thing about Social Media Day (and the deciding factor as to why The Masters decided to attend) is that the event is FREE. It’s not everyday that you get to attend a cool networking event for free, and have amazing free swag dangled in your face (take a look at the fun sponsors the SD event had here). With the free entrance, the swag bags offered to the first 100 entrants, free prizes being announced all night, and free tasty treats, we were sold! We got to the event just minutes after it started, but unfortunately, the swag bags had already been snatched up. I guess that is the downside to a free event open to the public. It was even rumored that hotel employees snatched them up – oh the drama us social media types can create! However, we didn’t totally miss out on the freebies. Best free stuff we got? Food and booze. Yup, that’s right, free drinks. In addition to the free wine tastings and Magners Irish Cider samples, we were hooked up with an incredibly strong vodka drink from Cirrus. We got it just because we were fascinated with their pretty ice orbs that aren’t supped to melt (or at least melt very slowly). The ice balls were very cool-looking (pun intended), but they melted just like their lowly cube cousins. Overall, it was great to meet some new people, especially the ones we already have some sort of relationship with online. “So great to finally meet you in person” was probably the phrase of the night. We also got to hang out with some of the cool peeps from NBC San Diego, such as our good friend and web producer, Sarah Grieco (center of photos). Just to put a little frosting on this networking cake we each received some new Twitter followers so we were content!